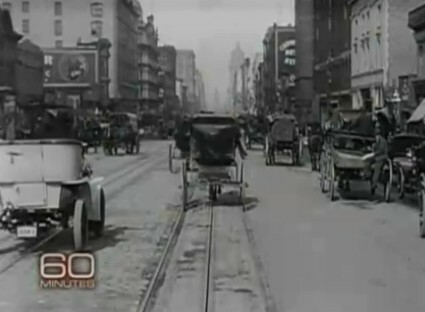 Last night CBS’s 60 Minutes programme had an item on A Trip Down Market Street, a ‘phantom ride’ view taken from a cable car travelling down San Francisco’s Market Street a month or less before the earthquake of 18 April 1906. The film, three copies of which survive, and which can be viewed on the Internet Archive or on the Library of Congress’s American Memory site, was previously thought to have been made in 1905, but film historian Dave Kiehn presents evidence in the programme (including weather reports and car registration numbers) to demonstrate that the film was probably made in March or early April 1906. The producers were the Miles Brothers, and two of their descendants appear in the programme as well as film archivist Rick Prelinger, owner of one of the surviving copies (that which appears on the Internet Archive). We’ve covered the film on the Bioscope before now. There was a post on Bioscopist Joe Thompson’s discovery of a 1907 newspaper article on the film and more recently a post on the overlaying of a YouTube video of the film on top of present day Google Street View images of Market Street on the innovative There and Then site. The SFGate blog has a full account of Kiehn’s research into the film’s correct dating. The 60 Minutes piece includes footage of Market Street after the earthquake taken by a different filmmaker. Recently filmmakers Dan Meyerson and Matt Peterson put together a compilation of post-earthquake views of San Francisco, focussing on another travelling shot down Market Street. The post-nuclear landscape is all the more extraordinary for the matter-of-fact way in which people are seen to be still going about their daily business. Looking at pre- and post-earthquake films, the buildings are transient, fragile constructions, but ordinary people endure. Who shot the post-earthquake films I don’t know. Some of the footage appears in a unidentified series of films of San Francisco in 1906 to be found on the Internet Archive (again from the Prelinger Archives). The main journey down Market Street appears to be unique, however. Anyone know who the filmmaker, or filmmakers, might be? “the buildings are transient, fragile constructions, but ordinary people endure” — very well put. Historic Cameraman Sprague Anderson shot another “A Trip Down Market Street” for the San Francisco Exploratorium in 2005 with his vintage hand cranked Bell & Howell 35mm camera. He used the same camera to film “Triumph Over Disaster” of the 2006 Earthquake Centennial Ceremony at Lotta’s Fountain. David Kiehn himself edited the film which was screened at the San Francisco Silent Film Festival at the Castro Theater. There is some evidence that the post-earthquake trip down Market Street and return trip footage was also shot by the Miles Brothers. The company packaged programs of before and after footage for theaters across the United States and some detailed reviews specifically point out the Market Street trip after the quake when the street cars were electrified and running. I had been wondering if that might be possible. The similarity of construction and the fact that it is not the Edison or Vitagraph footage makes it a possibility. But where does the Vimeo footage come from?